I live near enough to the British Library to be able to walk to it. On Saturday I had a bit of a Paolozzi moment. First of all I listened to a recording of him talking about people he had known as part of the historic sound recordings kept by the Library. I was listening to this because he had something to say about Peter Watson. Outside the Library is his large Newton piece. 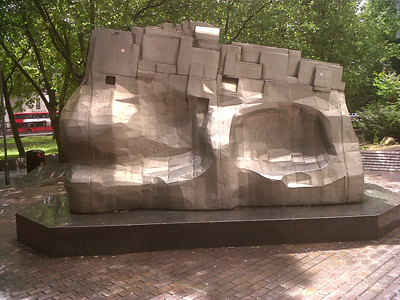 Less well-known is the sculpture lurking in front of Euston Station (below, right), which I walk past. Then my route takes me down Drummond Street and Longford Street. 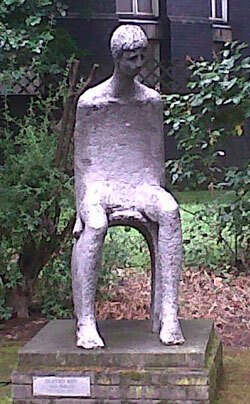 In a small area of grass is a sculpture (below, left) by the British sculptress, Jean Bullock. There doesn’t appear to be a lot of information available about her. She was born in 1923 and has an entry in Buckman. Regent’s Park is not particularly artist territory. Adrian Berg used to live in Gloucester Gate and anyone who takes Sotheby’s and Christie’s catalogues will have seen many Regent’s Park views by him over the years. (He now lives in Brighton). But there are literary moments as I walk home. At Clarence Gate I pass the house lived in by Elizabeth Bowen and subsequently by Louis Macneice. Then I pass Sussex Place, which was the home of Cyril Connolly at one time.